I am a new Irish flute player from Italy. Could you please give me some advise for cleaning the saliva near the embouchure? I tried by lightly oil the part but the area remains opaque. Any suggestion? I would think a damp cloth would be best. 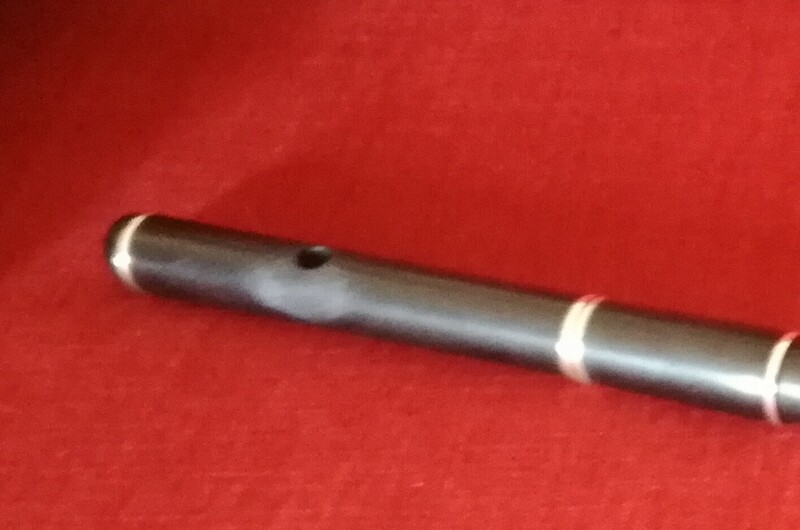 Sometimes the flute gets less shiny where the skin contacts the flute. This can be a transfer of body oils or if the flute had a shellac finish it may be wearing off. You are less likely to get saliva on a flute. I would just make sure the flute is dry by gently rubbing with a dry cloth and live with it. If you can post pictures we can be more helpful. Thanks so much to both. I can't open the image. I am not sure how to upload an image on this site, so I can't advise you on that one. Perhaps someone else can help. Thanks. I am a bit of a idiot in many internet things. I think you have a shellac finish and this is responding to the sweat where your chin makes contact with the flute. I would not worry about it. It may not be as pretty as it was when it was new but it will mark you as a person who plays their instrument. Much like your grandmother's end table would make a ring when you set down a drinking glass without a coaster, varnish finishes may turn white when exposed to moisture. If your really need to get rid of it I would research "How to remove water rings from furniture" and pick a method that is not toxic. They range from mixing oil with vinegar to using mayonnaise. I am not sure I would bother. Make sure you don't use anything you wouldn't want to ingest or expose your skin to. Some people have reported irritations on their skin from playing the flute. So adding an additional chemical may not be a good idea. Any experts out there? Could Conical Bore just wipe the headjoint down with vinegar and then oil it? I would definitely wait for more opinions on this. It looks like a fair number of people are reading this post. I think you have a shellac finish and this is responding to the sweat where your chin makes contact with the flute. Shellac is not outside the realm of possibility, but neither is it the first likelihood. Before I developed my blackwood sensitivity and had to use lip plates, all my flutes - none of them shellacked, lacquered or varnished - eventually became discolored at the same spot, and I saw that this was true of other people's well-played flutes, too. At first I tried oiling, but with dark woods what you see there is actually a bleaching, so oiling didn't really make a difference. The issue isn't saliva, but sweat and skin oils, and the chemistry of their salts and the like varies from person to person, so the intensity of discoloration will also vary from person to person. In the end I just took it as a given. Were I to buy a used flute I would expect to see the same discolored patch to some degree, and if it wasn't there I would assume the owner had hardly played it, if at all. It may be that some people's well-used flutes don't show the same patch, but I would count that unusual, and chalk it up to their bodily chemistry. Or a beard. It may not be as pretty as it was when it was new but it will mark you as a person who plays their instrument. Both my flutes (blackwood and cocus) will tend to show a slightly lighter-colored patch in that area after a while, but not to the extent of the OP's photo. If it's a shellacked flute, that might be why it's more prominent. Both of my headjoints are bare wood. When the discoloration around the embouchure hole starts to annoy me, I just rub a very small amount of cork grease over that area and the rest of the headjoint. This immediately makes the patch disappear and look dark and shiny, like the rest of the flute. That won't work on a shellac finish, but if it's just dried-out wood in that area, then it might work better than oil. Cork grease is a slightly more persistent barrier than oil. Never thought of cork grease. Windings wax also helps protect the exterior finish. Rub it on the external surfaces around the embouchure and toneholes and wherever perspiration and skin contact might wear at the finish. Friction softens the wax, so after rubbing it in vigorously, remove what is left by polishing the flute with a soft cotton cloth, until the flute shines. I don't have their proprietary windings wax (didn't come with the flute), but I'm assuming it's similar to beeswax and mineral oil, or beeswax and vaseline, any of those DIY thread waxes. Cork grease is not dissimilar, at least what I use -- a cheap lipstick-type container branded from a local music chain. So I've used cork grease to hold thread when wrapping or removing thread on a tenon, and to lubricate the tenons. It also works nicely as a cleaning/shining material around the embouchure hole and the outside of the flute in general. Finally, I have an ulterior motive in keeping the headjoint shiny with a wax finish applied frequently, and not just to polish up that dry area that develops around the embouchure hole. I have a fully-lined headjoint. Together with normal control of temp and humidity, I think it can't hurt to keep the outside of the headjoint ever-so-slightly moistened with wax to keep it from drying on the outside and cracking. Probably just a placebo, but at least it looks nice and shiny. I tried by lightly oil the part but the area remains opaque. Any suggestion? If whatever it is is water soluble I wonder if oil would just seal it in. I am inclined to defer to other's experience here. However, my practice is to give the flute a quick wipe over with a wet kitchen towel and dry it off, then put rather a lot of almond oil on before wiping that off and rubbing to a polish. My idea is that some things (sweat, dribble, beer etc) have water soluble components and others (oil from the skin, fingers, french fries etc) are more likely to be removed by oil. If I could see something that neither of those removed I might carefully try alcohol (one maker says he uses that on flutes that come in for service) but be prepared to have to give it a good oiling or waxing afterwards. Caveat - my flute is mopane which tends to darken with age and goes dark again in a few days if condensation coming through the holes lightens it. Thanks so much for all tour advises! I knew that petrol-based material are not allowed, since they can affect the wood. Wax is a good suggestion. I have another natural thing: karitè butter. Rod Cameron sends (or at least used to send) about a 1 cm3 piece of carnuba wax out with his flutes. He suggested rubbing it where your lower lip goes in order to prevent this happening. I've used it on a couple of flutes and it can reverse the effect at least to some extent. On the advice of Geoffrey Ellis, who made my Basketmaker flute, I use Clapham's Beeswax Polish.